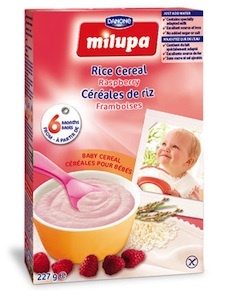 On Checkout 51’s list this week (Sept 19-25, 2013) is Milupa baby cereal, Any variety. All stages have different colored packaging making it easier for you to choose the appropriate step for your baby. When comparing Milupa baby cereals to other baby cereals, consider the additional cost of adapted milk and jarred fruits or vegetables you need to purchase in order to have the same nutrition balance. Milupa offers excellent value as each box contains 1 liter of skimmed milk powder in the baby cereals and whole milk powder in the toddler cereals. Milupa is easy to prepare and convenient. Just add water. Milupa baby cereals and Milupa toddler cereals taste great since they are made from wholesome ingredients. Moreover, Milupa meals and cereals contain essential vitamins and minerals including iron and are therefore a healthy contribution to the diet of older infants. You will get $1.00 cash back rebate at Checkout 51. Here’s a pic of what it looks like. I found a couple prices of it at a few stores.